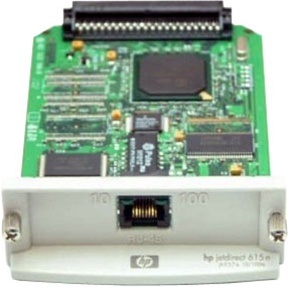 Our refurbished HP J6057A - JetDirect 615N Card, has been tested and reset to factory settings. If you are buying this with a HP P3015, it will be installed free of charge. Optimal performance for any HP EIO-based printer. Internet Printing Protocol (IPP) support for high-quality, direct-to-URL printing over the Internet/intranet. Installer v2.0 provides automatic discovery and installation of network printers (configurable by administrator). Embedded web server for status and configuration using a web browser. Automatic protocol switching for simplified printing in mixed environments. 2MB flash memory future-proofs your network by allowing for future upgrades. Supports NDS, NDPS, SNMP, DHCP/WINS/DDNS, BootP and lpd. Simple installation and management via HP Web JetAdmin and HP JetAdmin network peripheral management software.